A truck full of trash is the result of a community trash pickup along the beaches of Santa Cruz. Trever and Yilmer forge a new trail through the cloud forest. and being the photographer on a field trip with the kids. Trever manages multiple cameras while photographing the field trip. Chelsea enjoys the view near the top of Concepcion. she helped teach summer camp with Peace Corps. 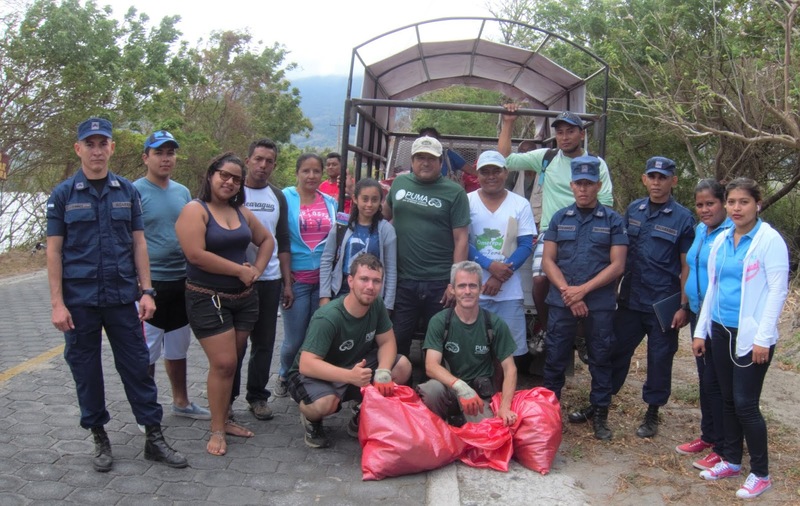 Chelsea collects trash with kids from Balgue, Ometepe. That's Kari from Peace Corps photobombing in the background! She then hosted a geology training session. Here you can see Chelsea and Trever tag-teaming the training. Chelsea plans on returning later this year to help develop more educational materials and community education. Chelsea also set us up with a meeting with Victor Vereb, a European geographer who is interested in creating a Geopark on Ometepe. On a more local level, Guias Unidos set up an exchange visit with Fundacion Colcibolca at the Mombacho Nature Reserve. 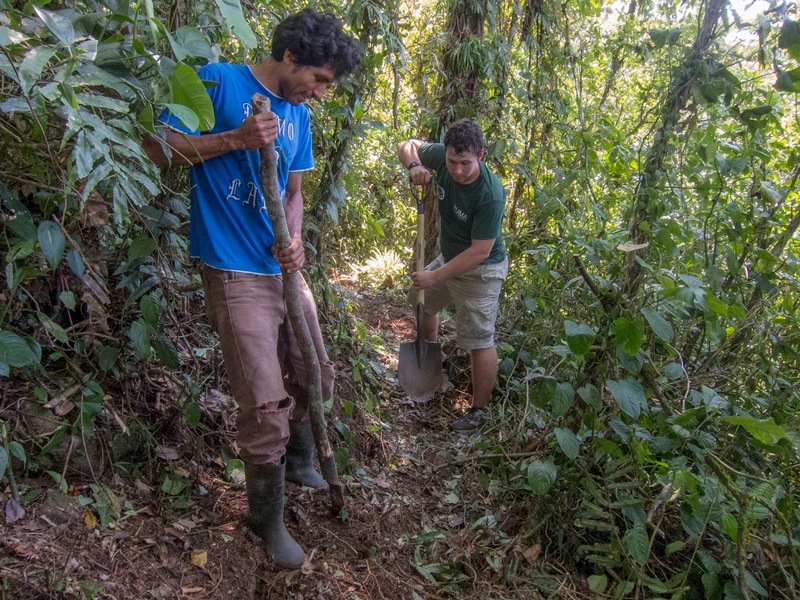 The rangers at Volcan Mombacho near Granada have arguably the most developed system of trails and guides in the country. 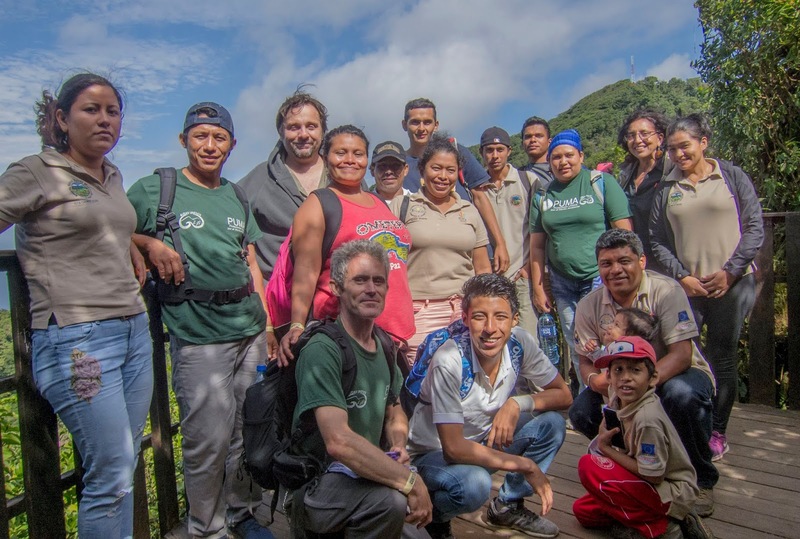 We funded 4 of the Ometepe guides to take a day trip to visit and learn about their training and resources. In exchange, the Mombacho guides took a trip to Ometepe to visit our new Resource Center and take a volcano tour. As the tours on Ometepe take a little longer than those on Mombacho, we hosted our guests for the overnight visit. In addition to our exchange learning trips and Chelsea’s geology classes, Trever and I were able to organize two classes on interpretation (how to develop engaging tours and presentations). We had a lot of fun in the classes, and we hope to do more. We lost the camera that took these pictures, but if we find a picture, we’ll post it soon. School “summer vacation” takes place between late November and early February, making our winter season ideal to focus on programs with kids. 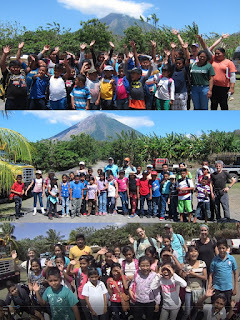 With our “Nature Libre” campaign (see our December blog post), we raised $1300 for experiential education for kids, with a focus on field trips. 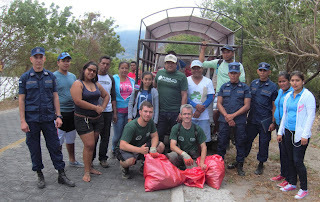 With these donations, we were able to rent buses for 3 separate field trips, bringing about 100 kids to the local nature reserve, Charco Verde. As these trips cost less than $100 each (less than $3 per kid), we still have funds for more programs. We plan on doing more camps next year, and we are also working with Peace Corps to create a “Junior Ranger” program for kids to learn about nature and go on more field trips. The highlight of our contribution to community education is our Resource Center and library, which we founded this year. We chose the name PUMA for our center and the group that works there. Although there are no pumas who live on the island, they are a species that spans the entire Americas, representing our unity across borders. Puma also stands for Protectores Unidos por el Medio Ambiente, or protectors united through the environment. As I and all of the USA volunteers are gone for the summer, a group of PUMAs is operating regular public hours of the "Centro PUMA" library. 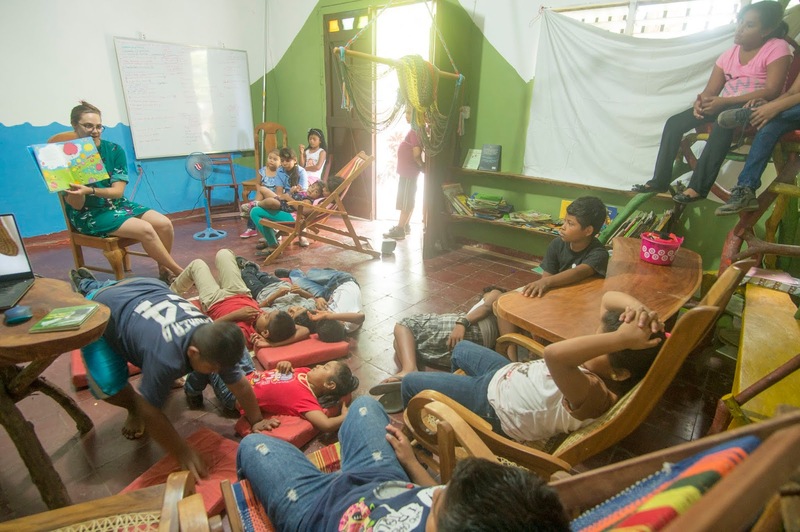 In addition to being open to the public 3 days per week, Centro PUMA has hosted events, such as story time in partnership with Peace Corps Nicaragua. In one memorable event, we read “El Lorax” to a group of kids before watching the movie together. Thanks to all the families, friends, and strangers who believed in us and donated over $5000 in cash and needed items to our project this year. This includes a group of generous Minnesota birders who donated 2 suitcases full of (about 20) binoculars to our project. Finally, a huge thanks to New England Biolabs Foundation (http://www.nebf.org/) who awarded us a $7000 grant that has made the majority of our work possible this year. It was a coincidence that I (Jeff) happened to fly out right as political unrest spread across the nation, but it will give us some time to observe developments from a distance. Protesters started in mid-April with a demonstration against social security reforms, but soon grew in numbers to protest against the government. President Daniel Ortega, who helped overthrow a dictator in the 1970s, is now being accused of acting like a dictator: eliminating term limits, influencing elections, and removing opposition parties from the running. In the past month, there have been dozens of deaths as protesters clashed against counter protesters and and police reportedly fired live rounds into crowds. 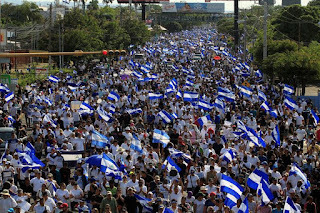 Many people fear the beginning of a revolutionary war in Nicaragua. 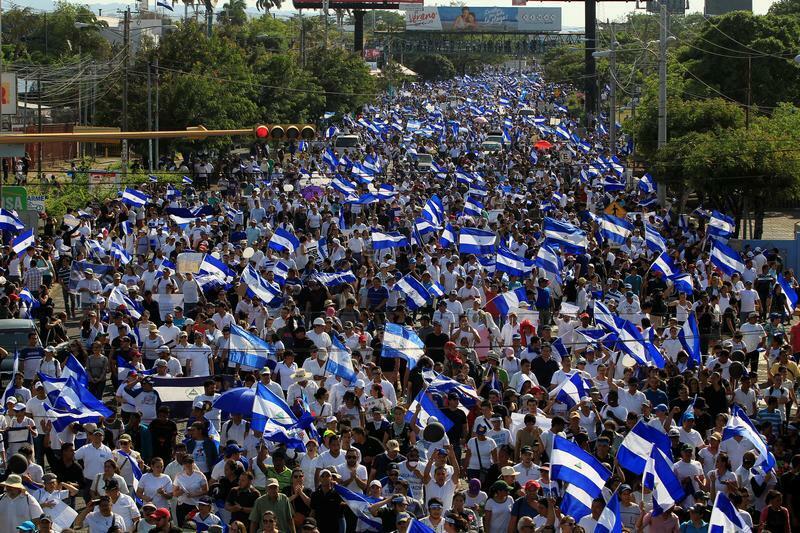 Since the protests began, Ortega has rescinded his social security reforms, but the unrest has continued. Many now insist that Ortega step down from his presidency. We understand that the situation is complicated, but we hope that Nicaragua can continue find a peaceful resolution to its disagreements. In the meantime, we plan on continuing with our project, but we intend to proceed with caution, especially as pertains to our volunteers. For those of you interested in volunteering, please keep in touch with us as we assess the developing situation.